CHARLOTTE, N.C. - Oct. 11, 2017 - PRLog -- TheInsoleStore.com has added The Foot Gym and ORoller manufactured by IngSource, Inc., makers of the OrthoSleeve. 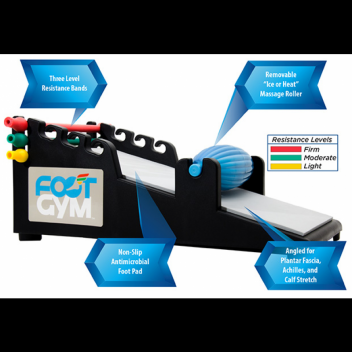 The Foot Gym® iis ideal for preventative and rehabilitation therapy for common foot conditions such as Plantar Fasciitis, Achilles Tendonitis, heel pain, shin splints, and more. President, Tyler McCracken, states "We are excited to become an authorized dealer of The Foot Gym and ORoller. Both of these products are revolutionary, affordable, and like no other exercise product that is on the market. The Foot Gym has resistance bands meant to be used with your toes, a massage roller (that can be cooled or heated) is to be used with the arch of the foot, and the angled structure is designed to help stretch caalf muscles, the achilles tendon, and Plantar Fascia. The ORoller offers a foot arch and leg muscle massager that can be filled with heated/cooled water. Both of these products will change the market for 'self-help' in both the prevention and rehabilitation of foot conditions"
Check out The Foot Gym or ORoller Today! TheInsoleStore.com is the Leading Internet Retailer of Shoe Insoles, Inserts, Orthotic Arch Supports & Orthotic Sandals for Men, Women, and Children.